Visitors to the State Tretyakov Gallery in Moscow are using virtual reality to explore the studios of two 20th Century Russian artists. Wearing a VR headset, users can create compositions, put colours on a canvas and upload the result to social media. Dutch company VRTech Group recreated the workrooms of two avant-garde artists using photos and descriptions. The director of the Moscow gallery hopes the experience will widen public participation in art. When users wear the VR headset, they can walk around the recreated studios of Natalia Goncharova and Kazimir Malevich. Goncharova died in 1962 in Paris where she spent much of her life. Malevich died in 1935 in the Soviet Union. In Goncharova’s studio, users can arrange items on a table and use a VR paintbrush to add colour to their design. In Malevich’s studio, it is possible to throw items at the canvas, where they turn into colourful shapes, in the style of the supremacist style which he founded. 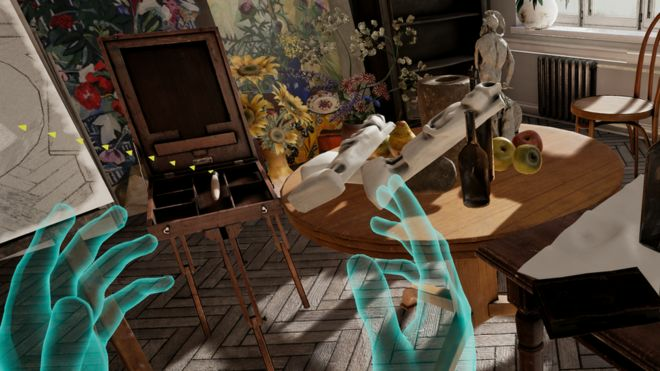 The use of virtual reality in art has been on the rise in recent years with galleries looking for ways to use new technology to attract visitors. The Tate Modern in London recently held a VR exhibition based on the later life of Italian artist Amedeo Modigliani. In Moscow, the Garage art gallery put on a Bidding for Glasnost exhibition which featured a virtual reality auction. Zelfira Tregulova, director of the Tretyakov Gallery, hopes that galleries can make art more accessible through the use of technology. “We showed this program to some specialists who are trying now to introduce new means of education, and education about art at secondary schools, and they were really amazed how quickly and easily this introduction could be carried out,” she told the BBC. As the technology develops, Ms Tregulova is hopeful that the Tretyakov can reach people in more remote parts of Russia. “This could be a strong impetus for children in schools placed in towns or regions where there are no real museums, to understand that art is not something which is an obligation which is imposed on them that it’s a very involving, interesting world to experience,” she said. However with the price of high-end VR kits stretching into the thousands, cost is often a consideration for art directors.